There was a trail on the river left side heading up to falls. It is short, as the waterfall can be seen from the bridge. Once there, it was maybe 15-20 feet at most, not terribly high, but a nice river wide series of cascades. There was a really cool pothole that contained a deep pool that I imagine would be a wonderful place to be on a 90 degree day. There were also some remains up here of days gone by. Obviously some type of mill was once here. I didn’t spend much time here. There really wasn’t too much to see. I still do not know if it is OK to visit here, but all the nasty signs are gone. After this, my day was still largely unfulfilled. 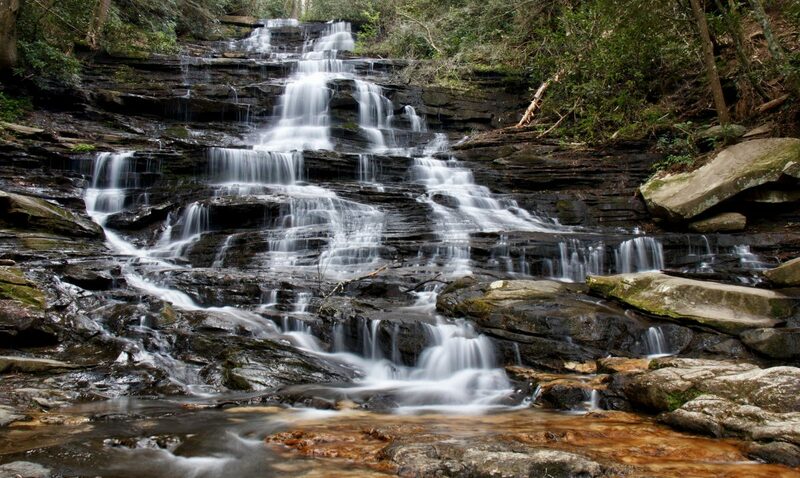 So, I decided to look up Pot Branch Falls in Kevin Adam’s North Carolina Waterfalls. I remember reading that it was somewhere in the South Mountains. He put a nice color picture of it in his book which is probably why this was the first thing that came to mind in a situation like this. Page 112-113 is where this is described. I could tell immediately that I was on the wrong side of the South Mountains to find Pot Branch Falls. I actually needed to go around them and come in from the west side. I went south, west, then came up NC 226 to find Jonestown Rd. Kevin Adam’s book describes it coming from I-40 in Morganton, getting off on exit 103 on US 64, following it for 15 miles west, then 7.5 miles east on NC 226 to Jonestown Rd. Once on Jonestown Rd, go for 1 mile to Melton Rd, and take a left. Follow Melton Rd for 1/2 mile or so, until it makes a 90 degree turn left. Coming into Melton here will be the gravel “Old CC” Rd. This is the road for Pot Branch Falls. Follow it for just over 3 miles to a large open parking area with 2 gated roads, one on each corner. You will have just passed a church on the left….just for reference. One of the highlights of this dirt road was fording a creek. This is not something I usually do in an old Honda, but it was small and worked just fine, just a little rough. Once parked, look to the gated road on the right. It will head somewhat downhill, take this for 0.3 miles or so, not far. There will be 2 small creeks to cross, the second being Pot Branch. Look for a trail heading off to the right, not far after the second creek crossing. After making the turn, Pot Branch will need to be crossed again. Its a small creek, shouldn’t be a problem to most. After the crossing, the creek begins to pick up and start dropping. I headed just downstream from the falls and worked my way down for the view. From this base, this 25 foot, 3 tiered falls looks rather unimpressive in photos It was quite nice in person(for a small stream). I wanted a better view, so I worked my way up to the top of the bottom drop. There was a very deep and somewhat large pool here that can’t be seen from the bottom. To really see the falls, I needed to find my way across the creek though. This meant walking along the slick wet rock with the deep pool just on my left, and the bottom of the falls to the right. This is where the water leaves the pool and continues to fall. It was very shallow. I was only worried about the rocks being slippery, so I used a hiking stick and carefully crossed. This deep pool would be an excellent swimming hole in summer. Once across, I still was not satisfied. I had a better view of the main drop, but the rocks were still blocking part of the falls. I wanted to climb up here but the entire section of the rock walls here were slippery and wet. I was able to use Rhododendron to get a slightly better view, but still not what I wanted. Here are some of the better shots I was able to get. The hike out was simple once I made it back across and up the bank. The bank was the steepest section of this hike. Back to the car in no time, this hike may have been 1 mile round trip. If coming to visit this one, I would certainly plan it in with another hike or several small ones to make it a worthwhile trip.